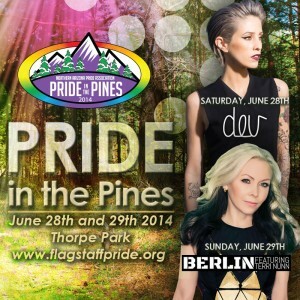 Beat the heat at 7,000 feet for the 18th Annual Pride in the Pines Festival on June 28 and 29. Pride in the Pines has a new home at Thorpe Park, just a few blocks west of historic downtown Flagstaff. Join the family friendly festival where you can enjoy live entertainment, delicious food and a craft and play children’s area. Pride in the Pines is so inclusive that even your dogs are welcome! The event features a lineup of music and entertainment over two days in celebration of the diversity of our community. As a continuing sponsor, Bookmans wants you to enjoy the beautiful weather and all the perks that come along with being a Bookmans customer. We have five VIP tickets for you this Ticket Tuesday. Come out Saturday, June 28 and see hip/hop pop sensation Dev headlining that evening at 7:30 p.m. Also appearing on the main stage, from RuPaul’s Drag Race, Shangela and many more local artists throughout the day. On Sunday, June 29, American new wave ’80s favorite Berlin featuring Terri Nun headlines at 4:30 p.m. with local Arizona’s favorite blues singer and Flagstaff local, Sir Harrison Begay, and east coast singer songwriter Chris Pureka. While enjoying the festivities stop by our Bookmans tent and spin the prize wheel. Have you been naughty or nice? We have great giveaways planned just for you. Pre-sale tickets are only $10 for each day or $15 the day of at the gate. Also new to this year’s festival is the VIP Lounge weekend meet-and-greet pass for $55 online and $65 at the gate. Children under 12 are free. To enter our Ticket Tuesday giveaway, tell us in our comment section what you like to do in Flagstaff during the summer. We will select five winners using random.org. Winners will be notified by e-mail sometime on Wednesday or possibly even Thursday. Be sure to check your e-mail inbox for a message from us to find out where you can pick up your tickets. Comments are moderated and may take some time to appear. Please do not resubmit your comments — one is plenty. For the summer I enjoy all that Flagstaff has to offer outdoors wise. From camping to fishing to the Hullabaloo and Pride. I also enjoy getting out and about downtown during the summer to meet up and hang out with the ‘locals’. I mainly enjoy my random drives to the mountains through the aspens and pines. Summer is a blast here at 7000 feet and definitely beats the heat! Contest now closed! Winner will be contacted shortly.